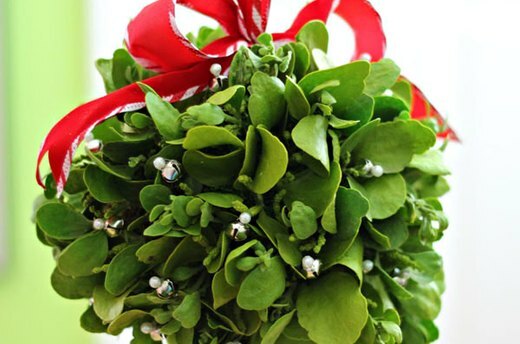 To make your own mistletoe kissing ball, you will need sprigs of fresh mistletoe, ribbon, sheet moss, a 4" floral foam ball, florist wire, greening pins, holiday bells, corsage pins, and scissors. Fresh mistletoe is usually available at local Christmas tree lots, and is also sold online from mistletoe farms. 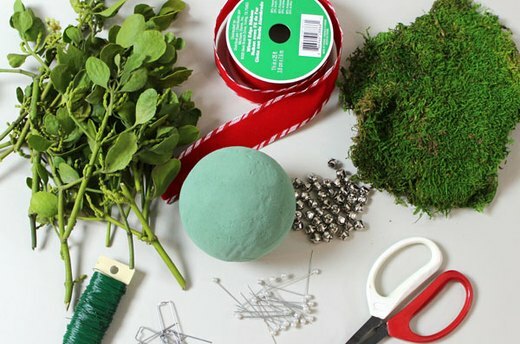 Sheet moss, floral foam balls, florist wire, and greening pins can be found in the floral supply section of crafts stores. 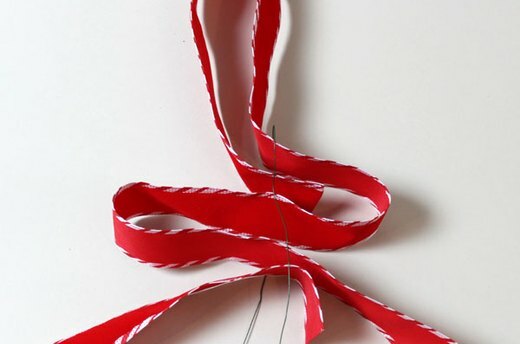 Cut a 30-inch piece of ribbon. With this ribbon, make a 12-inch loop (this will be the hanging loop), two 6-inch loops on opposite sides of the 12-inch loop, and a 6-inch tail. Then cut another 6-inch piece and place it on the opposite side of the first 6-inch tail, as shown in the photograph. Tie all the loops together with a 12-inch piece of florist wire, twisting the ends of the florist wire tightly. Insert the twisted length of wire through the foam ball so that it goes in one end and out the opposite. Bend the wires so they cannot be pulled out. I actually attached one of the holiday bells to the end of the wires as an anchor. You do not have to soak the foam ball in water, as a water source does not significantly prolong the life of cut mistletoe. Covering the foam ball with moss creates a background layer for the mistletoe. That way, there are no empty spots on the ball, even where there is no mistletoe. 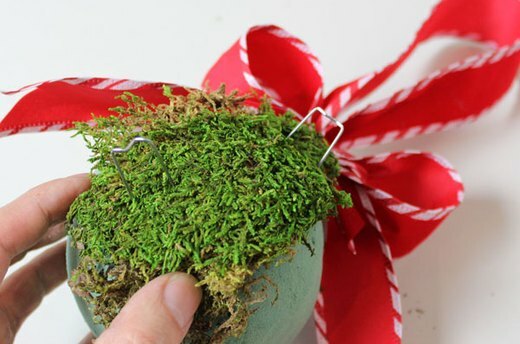 Tear pieces of sheet moss to fit around the ball and secure the moss with greening pins. 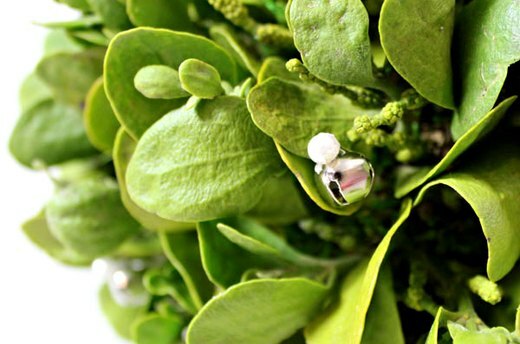 Cut the mistletoe sprigs into smaller 2-inch pieces. You will need about 100 of these small pieces to cover the foam ball. This may sound like a lot, but each sprig of mistletoe can usually yield between four to eight individual pieces. Some pieces will be fuller than others, creating more depth and variety in the finished kissing ball. Starting at the top and moving downward, insert the mistletoe pieces into the foam ball. 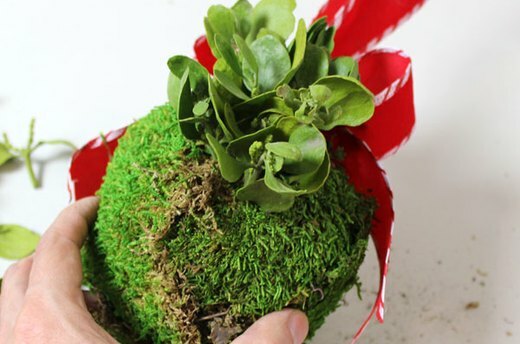 If you have trouble getting the stems past the moss layer, just create a hole in the moss with your fingertips so the mistletoe can slide through it. Keep going until the ball is covered. 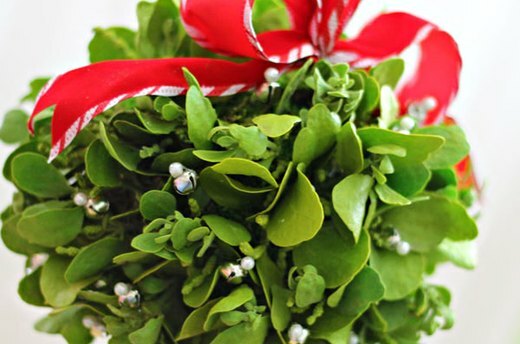 If you do not have enough mistletoe, you can supplement the ball with other greenery like pine or holly. The kissing ball will already look beautiful at this point, but adding some embellishments will make it more festive. Slide pearl corsage pins through the opening in the holiday bells. You may want to glue the pin to the bell to keep it from moving around. Corsage pins are available in the DIY wedding section of your local crafts store. Insert the pins into the kissing ball, just far enough so that the pearls and holiday bells are still visible against the mistletoe. 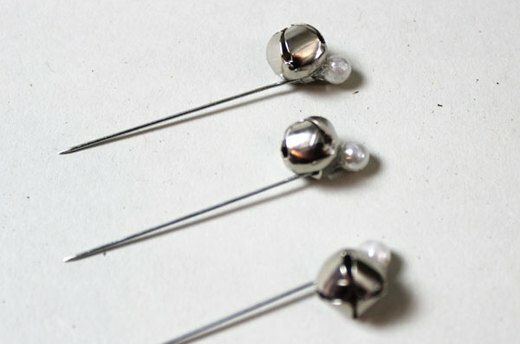 You will need about 36 pins around the ball, but the more the merrier. Using the large loop at the top of the bow, hang the kissing ball above a doorway. The mistletoe will keep fresh for about two weeks in a cool room. You can also refrigerate the kissing ball to keep it fresh longer. Now pucker up for that Christmas kiss.